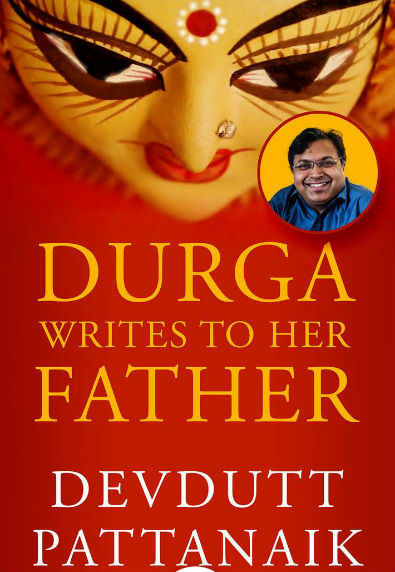 Recently I got a chance to read Durga writes to her father by known mythologist and speaker Devdutt Pattanaik. Devdutt Pattanaik is not only a scholar but he is a good book explorer too. The topic on which he writes or talks require a lot of research, especially reading of ancient Indian Literature. He then tries to put it together by mixing intelligence, wisdom, and modernity into the mythological tales. And, in most of the cases, people love his work(s). Your people declared he does not like to mate, make babies with tears. Who teaches zoology in your schools? This is what happens when Saraswati is reduced to vocational training, rather than education. This could have given you the idea of what to expect in the book. The book is really a short read (as the name suggests) so I will not dive into the plot much. The letter (let us call it a letter, instead of a book) talks about many things including some of the issues we see in our contemporary times and some issues which exist since ages and it seems we, the mankind, is not keen to get rid of them. Everyone chases her, like wolves chasing a goat. But no one makes himself worthy of her, like a flower fragrant for the bee. This is what I consider women empowerment in reality is. It is not about women wearing short dresses or shouting abusive words; it is about the mindset. Both men and women, instead of considering other as a second gender, respect each other and try being worthy of each other, then and then the society will remain balanced. Devdutt also tries to represent his views about the basic needs of each human being on the ground of reality. Why do your people glorify men who shun women, or deny women pleasure? Now, some of us, who don’t think logically, may be offended by it. But, if it is read logically, then it is something which is obvious. And yes, the book has some interesting takes on the stupidity spread in the name of modernity and excessive use of gadgets instead of the mind and the brain. She complains that the stupid in your city feel smart because they have access to Twitter. Understanding self is now about uploading selfies. I really wish that this sarcasm hit the nerve it intends to. Durga is very clear in her vision and thoughts, obviously, and she is fearless when it comes to express her thoughts. And it should be like that only. The idea or “being eligible” is being “out of context” these days. People think that they are entitled to get what they want, by default. It is the wrong concept at the core. Unless and until we don’t make ourselves eligible for something, how can we expect it? In short, we need to earn what we want. If I want a man, I will face death and walk up a mountain for him. I will dance on him as Kali and wake him up until he satisfies me. But if I don’t want him, whether he is Brahma or Bhairava, I will behead him. So, as it is mentioned, the concent is the most important thing. We, despite considered as most intelligent species, see quite opposite examples in our history and they are even evident in modern days as well. Above lines showing the true spirit of Durga are not only to read but to digest. The letter also talks about the way we conveniently use religion and/or resources in a way which suits the most to us. Talks about many traditional rituals and other stuff in the same context is mentioned pretty much effectively in this letter. Actually, telling more about it will not be spoiler free and that’s why I need to stop here. Those I kill and those I love often merge into one. Devdutt brilliantly weaved the ancient wisdom, feminism, contemporariness and sarcasm all into this small EBook. It is worth to note that this short EBook is available to read for free on Juggernaut App. So, you have to pay nothing but the time to read it. Definitely a worth reading short letter. But, it must be read with an open mind and one needs to understand the sarcasm in it. It explores some of the brutal realities quite bluntly and read it only if you can digest it. I am tired of being taken for granted. Keep reading and keep expressing, you are really an intelligent person who knows how to craft your thoughts in proper words. I sent it as an email to Devdutt Ji but I he didn’t reply. I would love to share it here. As there are replies for all letters, I wondered what would the father write back to Durga? So here, I came up with this short writing. A reply letter from the father to Durga. Do reciprocate your views after reading this. I received your mail. Narada delivered it on time. I see. You are facing a dilemma. You are hesitating to visit your father’s home this time. My Princess, I know that there are hundreds of my people who offend you and your children. They seek to glorify the man you slayed and attempt to attack on your complexion. But there are millions of them who wait for this autumn season. They wait for your arrival along with your children. They weep in joy on your arrival. They love to adore the cute Ganesha and serve him loads of sweets. It feels so nice when I tickle him on his huge belly and he erupts into his laughter ! My people love to indulge in long knowledgeable conversations with Saraswati. I really get astonished to see the amount of skills and knowledge she possess. Regarding Lakshmi, she’s their darling. She is always eager to provide us with all the material benefits, be it money, food, health, fame and prosperity. Her company is always a dream come true for us. And why would they want to miss talking to Kartikeya about his warrior skills, about the wars he fought and the glory he brought. His presence makes them fearless and brings courage. I know my dear that your rituals are esoteric. They withhold the symbolic secrets within their procedures. Alas, I know they sound hollow to you these days. Thats because, I feel that the rituals are carried out rhythmically without seeking what is their meaning. The mantras are blindly chanted , with little emotions, which may irk you a little. The artisans have portrayed your form in different colours. Yellow, sometimes black, many times blue, at times orange and many others. When they paint you yellow, they adorn the form you took on that wedding day. When they paint you blue, they convey the idea that the sky is your cloth. No finite piece of fabric can drape you within its folds. Your form Kali is not at all worshipped in the primal, naked form. It is burdened with jewelleries and clothes which make no sense to that form of yours. My Kali, I understand that you feel sad when our people don’t accept your nakedness. They’re afraid of it. They live in culture, not forest. And they don’t want their daughter to discard her bridal attire and return to her wild form. That’s why they offer you clothing. Jewellery. Nose ring. In an attempt to domesticate you. Change is the only constant in the world. And people have changed. Iconographies have taken a turn. And I understand why Saraswati refuses to come this time. Yes, knowing the self today is equated to uploading bunch of selfies on social networking sites. The grandeur of ancient poets and storytellers is underestimated by some. But tell her that she need not be upset if many of them don’t recognise her latent forms. Tell her that there are still millions who adorn her goose in its original form. Not everyone agrees with the court jesters. But they are bound by rules. They are shy to protest. But this does not means that they don’t acknowledge her. They still love her. Lakshmi must be very upset. I know. My people are wildly chasing her without proving themselves to be worthy of keeping her. I ask her for an apology. Girls today are afraid to wear dresses that exposes their body a little while men are always eager to boast their six packs abs. Really the conditions have worsened. The women who used to dance in streets are frowned upon. This culture has become quite biased. Not everyone is treated equally. But daughter, tell her not to leave us alone. Your arrival in her absence will make us unable to handle the expenses for your visit. Tell Kartikeya that we adore him equally as Ganesha. In south, our people love him so much. As for marriage, yes, our people are divided into opinions. But tell Ganesha and Kartikeya not to worry. These mythologies are truths of various communities put together thousands of years ago in the form of Puranas. And being subjective truths, they are bound to differ. I know that my people have got too engrossed into the literal that they have forgotten the symbolic. If its the mind discovering its potential by seeking inside rather than in nature, they assume it to be a man shunning material pleasure by seeking solace in forest. Symbolic mind is literally taken as man. And symbolic nature as woman. And when this happens, problems arise. But my daughter, we do not know which reading is valid? The symbolic or the literal? Only you, who is Bhagwati, has access to all slices of The Truth while we struggle with our single slices of our truth. So we try to expand our mind by considering every reading valid. Regarding your husband, my daughter, you must know that you were eager to marry a hermit. It was your choice. We tried a little to change your mind but you were adamant! It was your sole decision to marry him and turn him into a householder. So dear, you should not get sad. Be patient. Things have got corrupted at a great level. Yes, we have men who love to prove your history, the history of man Ram who started this festival of Sharad Navratra. They seek Krishna in past. They have forgotten the faint line that separates history from mythology. I apologise for that. You must be fed up with the veg food. I know you are nature that consumes all. But this culture feels sad for prey while angry at the predators. We are biased. This biasness arises from our emotions. And we can do very little to change it. While we shun symbols in ancient texts, we eagerly do a symbolic sacrifice to you by smearing a cucumber with red powder. I am really sorry for that. At last, my daughter, I want to say that our people have thousands of shortcomings. They have made your children upset. But please know that we wait for one full year to spend this time with you and your children. We weep in joy when you come. Do not abandon us daughter. We love your presence. We are crazy for appeasing you. We love to comfort you when you complain about your husband. We are delighted when your children bless us with boons. We get enchanted when we worship you and circle the fire lamp round and round in front of you. We are fond of that aura that emanates in your presence. We feel content when the joy of feeding you kindles in our heart. We are eager to present you with the best piece of fabrics and jewelleries. Heaven descends at your lotus feet. My Princess, consider it as a request. Get mounted on your lion. Ask Ganesha to climb onto his rat, Lakshmi on her elephant, Saraswati on her goose and Kartikeya on his peacock and hurry up! The time is less and the journey is a long one. Do come daughter. At least for those who truly adore you. Who love you without conditions.